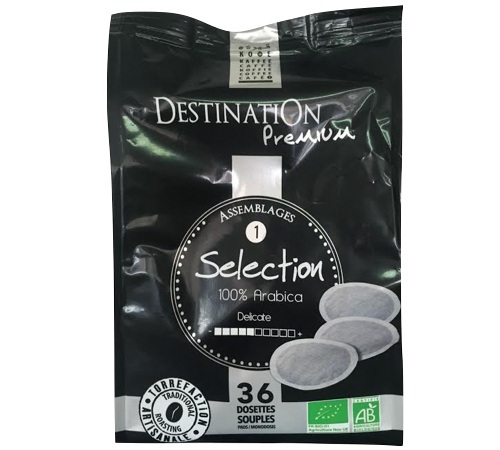 Selection N°1 by Destination is a blend of 100% Arabica organic coffees. 36 soft pods compatible with Senseo coffee machines. Mild coffee. Destination - sharing their Girondine expertise. For 10 years, their traditional roasting methods have been producing a large choice of organic and freshly roasted coffees, most are Fair Trade certified. 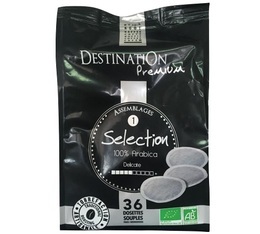 Also discover a large selection of teas and powdered chocolates from the best territories, imported via short food supply chains and already gracing some of France's finest tables.Destination has become the market leader for organic products in France.